The most common infection in dogs and cats these days are flea and tick. While these pesky critters are not very dangerous, they tend to cling onto the pet’s skin causing immense discomforts. Hence, it is important to get rid of them as soon as possible to avoid further issues. 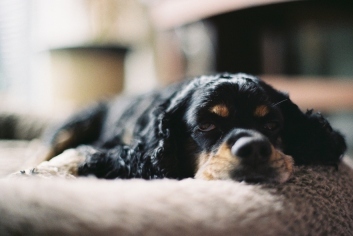 Since such a condition is a highly common problem in pets, it is obvious there would be numerous treatment methods. 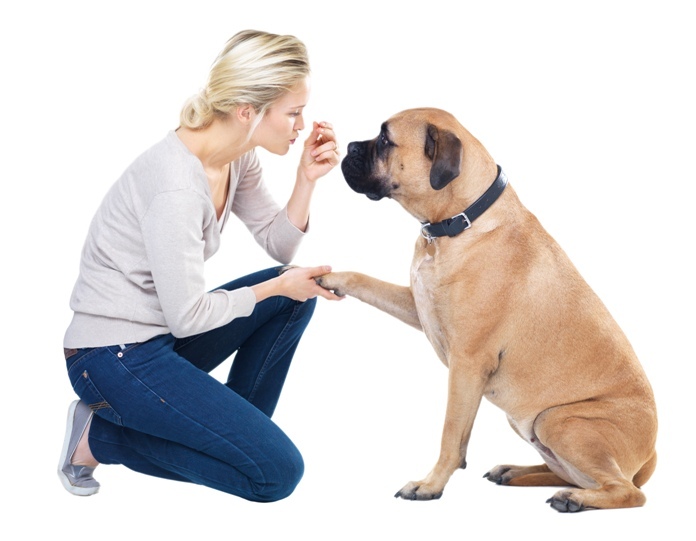 While there are several products that do the job of eliminating ticks and fleas, it is important to select the best possible product for your pal. For that, it is essential to first know about the products and later, compare them. What it kills? – Frontline Plus kills fleas within 12 hours and all major ticks within 48 hours in both dogs and cats. Furthermore, it supports the treatment of flea allergy dermatitis and saves your pet from vicious bites. It also protects dogs from dangerous diseases like Lyme disease and Rocky mountain fever. What it kills? – Bravecto effectively kills various species of ticks as well as fleas and at the same time gives protection from fleas and ticks for 12 weeks. It also provides protection from lone star ticks for up to 8 weeks. What it kills? – Bravecto Spot-On for cats treats felines from ticks and fleas and provides protection for 12 whole weeks. It effectively eliminates fleas within 8 hours and ticks within 12 hours. This topical solution is also useful in treating flea allergy dermatitis. What it kills? – Nexgard beef-flavored chews kill and provide protection from fleas. It is also handy in treating ticks including black-legged tick, American dog tick, and Brown dog tick. What it kills? – Advantage for Dogs and Advantage for Cats not only kills fleas but also gives flea protection for up to 8 weeks. It also reduces flea bites and is used as a great strategy in treating flea allergy dermatitis. What it kills? – Frontline Top Spot for dogs kills fleas and ticks as well as chewing lice. It is also highly useful for treating sarcoptic mange and assists in the treatment of flea allergy dermatitis. On the other hand, Frontline Top Spot for cats destroys adult fleas, chewing lice and is used as a good strategy for flea allergy dermatitis. What it kills? – Advocate boasts of multiple uses that include flea killing, demolition of gastrointestinal worms (hookworm and roundworm in cats and dogs and whipworm in dogs), and removal of ear mites as well as erasing sarcoptic mange and demodicosis in both cats and dogs. It is also used as good heartworm preventative. What it kills? – Revolution effectively kills fleas, flea eggs, flea larvae, gastrointestinal worms and prevents heartworm and treats ear mites in cats and dogs. It also treats sarcoptic mange in dogs. What it kills? – Simparica chews do not only eliminate fleas and ticks, it also prevents reinfestation for a month. What it kills? – Seresto collars erase fleas, flea eggs and flea larvae in both cats and dogs and provide thorough prevention for months. Furthermore, these collars are also effective in removing and preventing ticks in dogs. 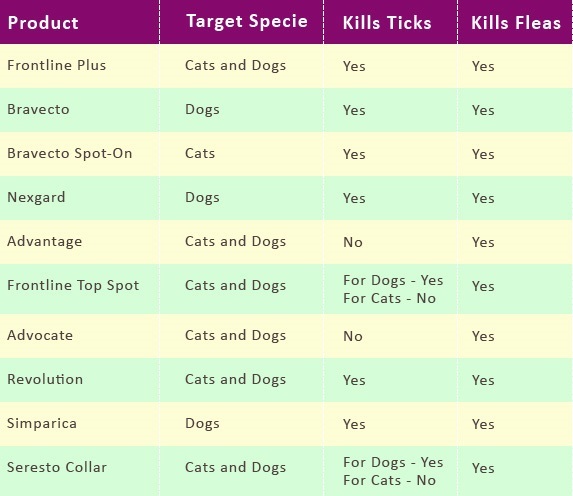 The table below will give you an overview of the different flea and tick products. 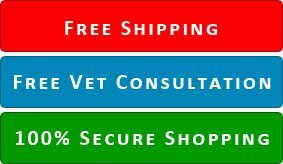 We hope the comparison has helped you understand each product and at the same time aid you in selecting the appropriate flea and tick treatment. If you are still unsure about which product to opt for, it is advisable to visit your local vet.